Bird scientists have sounded the alarm that the vulture, a scavenging bird of prey, is going out of extinction in Nigeria because of the epic hunt for its eggs by fetish politicians, who allegedly use them to acquire mystical power making charms to win elections. Desperate fetish politicians. Those who spoke to NDV, disclosed that the search by desperate politicians for the eggs has intensified as 2019 approaches, cautioning that appropriate measures be taken to safeguard one of nature’s chief vacuum cleaners from extinction. One of them, an Associate Professor, Department of Forestry and Natural Environmental Management, University of Uyo, UNIUYO, Uyo, Akwa Ibom state, Dr. Edem Eniang, told NDV that vultures were now endangered because some Nigerian politicians use the eggs highly demanded by native doctors for supernatural power and preparation of voodoo to win elections. A trader at Akparandem Market, Uyo, who trades in birds, Madam, Etiowuwan Imoh, confirmed that an egg of a vulture costs over N1million because of soaring demand. Politicians, who prefer anonymity, acknowledged in separate chats with NDV that some desperate power seekers could go to any length to win elections, but others feigned knowledge of the bizarre practice. Dr. Eniang, who confirmed that vultures were disappearing in the country, maintained that unscrupulous politicians were capitalizing on its spiritual potency to hunt the eggs for spiritual fortification. “The vulture is a very special bird created by God to serve as a natural vacuum cleaner, they clean-up all available rubbish, but the politicians and favour seekers hunt and pick the eggs of these special creatures for their fetish needs, diminishing their population and not allowing the eggs to be incubated and hatched,” he lamented. According to Eniang: “They sometimes engage community youth to climb very high trees to get the eggs for them. These youth climb Iroko trees in the midnight to pick vulture eggs. They climb at darkest night knowing that the vulture does not see in the night to steal their eggs. “Unfortunately, the vultures do not lay many eggs and they lay once in a year and the eggs are most hunted. He further said, “Nigerian politicians are too desperate to get power. You do not need juju animism to win an election. Your antecedent and pedigree should pave the way for you, not the eggs of the vulture. Do not depend on the mystical potency of the vulture’s egg”. 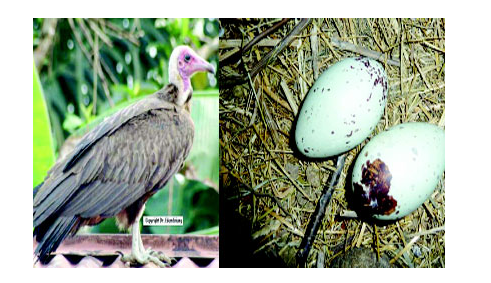 Inquiries by NDV showed politicians spend as much as N1.2 million to buy a vulture egg untouched by human hands for spiritual power allegedly embedded in the egg, while the one touched by the human hand costs only N20, 000 in the local market. Besides politicians, businesspersons also seek the eggs for vulture for its alleged supernatural power. Vultures lay their eggs on treetops usually above 40 meters high in the forest. The common standard practice is contact hunters through go-betweens and they pay them lavishly to supply just one egg. It could take a month and more for a hunter to locate the nest of a vulture in the forest and make sure that the vulture had laid eggs before engaging people to climb the tree at night, knowing that vulture does not see in the night to harvest the eggs. Those, who climb, arm themselves with dane guns, cutlass and bush lamps to search tree tops for vulture nests, especially the ones with eggs. The providential hunters it was gathered removed the entire nest with the eggs so carefully that they do not touch the eggs with their bare hands. They drop their hunt into a sack bags and lowering it to the ground with the help of a long rope before climbing down the tree to take them home depending on how many eggs are in the nest. A chieftain of the All Progressives Congress, APC, Elder Enefiok Ekefre, however, said it was speculative as nobody can boldly come out to admit knowledge of the use of vulture egg for spiritual purpose. He said the constitution of Nigeria does not restrict any citizen from practicing any specific religion, saying, “We have Christianity, Islam and African Traditional Religion. You can belong to any of the group, you will not have a problem with the constitution. “Those politicians who go to shrines have their rights. Even in Latin America, they practice Voodooism. Some Nigerian politicians are in Ogboni and other fraternities. Some go as far as to India to import Hinduism. I know they do some funny things like hypnotism to influence any person or group of persons they want to influence,” he said. Madam, Etiowuwan Imoh, who spoke to NDV, at Akparandem Market, said it was very difficult to trade in vultures because everything about it was very expensive. “You must be a very rich business woman to trade in vulture eggs. The whole of my life savings from this petty trade cannot buy one vulture egg. Even if you buy the egg, who will buy from you? “You have to wait for months before you can find one witch doctor who will ask for the egg. Here, the fresh egg goes for nothing less than N1.2 million, while the one that human hands have mistakenly touched costs over N20,000,” she said. Source: Vanguard.